A lock washer is a disk-shaped thin plate, typically with a hole in the middle, which is normally used to distribute the load of a threaded fastener. It often has an outer diameter about twice as compare to their inner diameter, which can vary according to its design. The most commonly used metal in the production of washers is steel. The different steel types used in the production of washers include carbon steel, spring steel, and stainless steel. These washers are also available in metals such as copper, brass, aluminum, titanium, bronze, zinc, and iron. Split and tooth lock washers are the two most popular lock washer types. A lock washer can hold the nut or other threaded fastener in place. There are many small and leading players operating in the market, which include Nord-Lock, Shakeproof, Disc-Lock Inc., Schnorr, and others that occupy a major share in the lock washer market. The benefit of lock washers lies in its shape. When it is compressed to the loads near the proof strength of the bolt, it will flatten and twist. This process reduces the spring rate of the bolted joint which maintains more force under the same vibration levels, which further prevents the loosening process. The lock washer market size is not high in U.S. and Western Europe. China is to expand its lock washer market share in forecasting period, owing to the expansion in automobile sector. Asia-Pacific has many lock washer manufacturer and producers, it produces the products for industrial sectors. Companies in developing countries, in contrast, put more effort on direct selling business. The competitor companies are more likely to develop their dealer network for the business expansion. As the local companies does not have international brand influence, their product quality is not good enough when comparing with leading companies, however, they have price advantage. These small players have expanded their market share in developing countries and low-end international market. Growth in the automotive, aerospace, machinery, and construction industries is expected to drive the market during the forecast year. Asia-Pacific is anticipated to remain the fastest growing sector due to increase in demand for maintenance and repair activities, increased construction activities, and automotive industry growth. 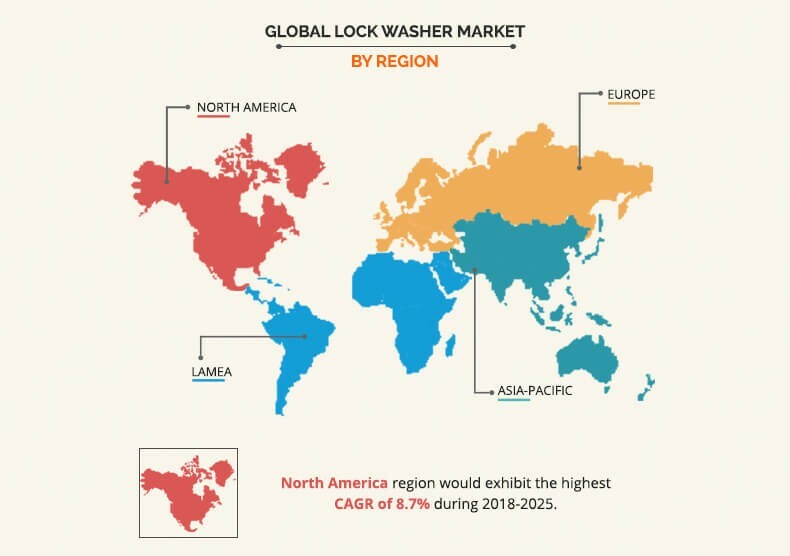 Countries such as China, India, Japan, the US, and Germany are expected to be the key demand areas which support the overall lock washer market growth. However, corrosion to these washers, prices of steel, and fluctuating foreign exchange are expected to hinder the growth of the lock washer market. Rise in demand for lock washers in industries such as automotive, aerospace, and machinery, among others is expected to fuel the growth of the market. Therefore, the industry players are focusing toward creating better and cost-effective ways to develop highly efficient lock washers. 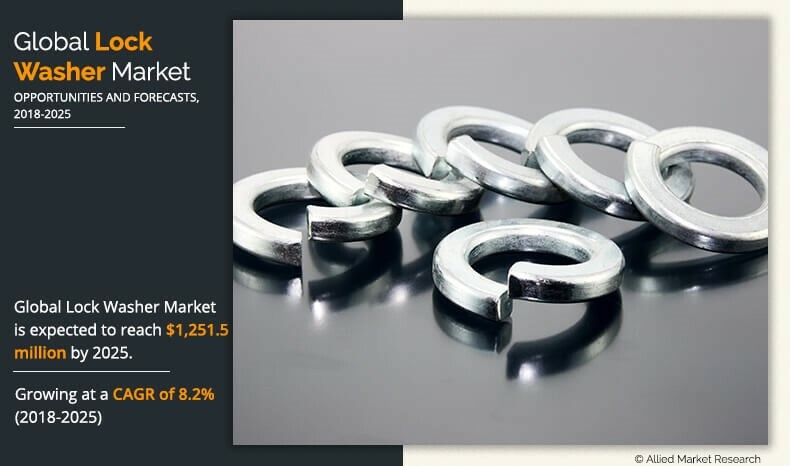 Furthermore, increase in demand for lock washers that are market ready and more sustainable is anticipated to fuel the demand for better quality lock washers providing an opportunity to the manufacturers, thereby boosting the growth of the global lock washer market. The global lock washer market is segmented based on product type, application, and region. Based on product type, the market is segmented into split, tooth, and others (hi-collar lock washers and wedge lock washers). In 2017, split lock washer segment dominated the market, in terms of revenue, and is expected to maintain this trend in the coming years. On the basis of application, the market is categorized into automotive, aerospace, machinery & equipment, construction, and others. Automotive industry is expected to secure the highest share during the forecast period. Based on region, the market is analyzed across North America, Europe, Asia-Pacific, and LAMEA. 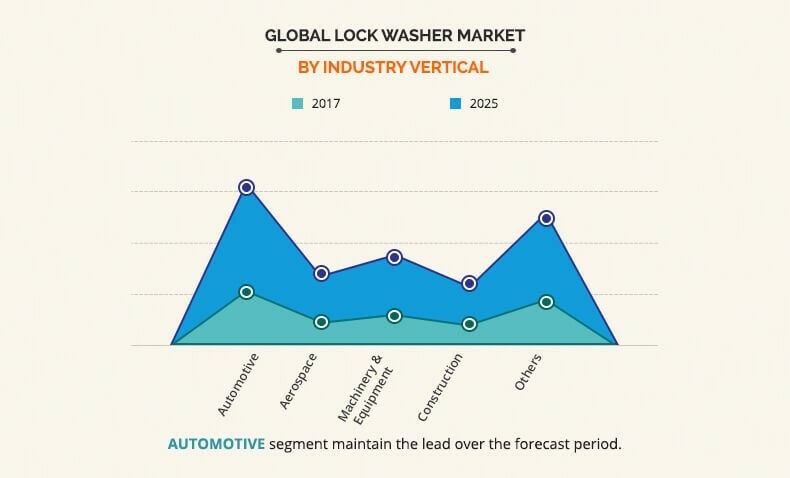 In 2017, Asia-Pacific accounted for the highest share in the lock washer market and is anticipated to secure the leading position during the forecast period. The major players operating in the lock washer market include Nord-Lock, Shakeproof, Disc-Lock Inc., Schnorr, Titan Fasteners, Hangzhou spring washer Co., Ltd., Midwest Acorn Nut Co., HEICO-LOCK (HWICO Group), Earnest Machine, and Wrought Washer Manufacturing, Inc.. For instance, companies such as Hangzhou Spring Washer Co.,ltd, and HEICO Befestigungstechnik GmbH have development on high quality lock washers for a multitude of fastening applications, in order to meet meet the fastening requirements of a multitude of industries with flexibility, innovation and quality. The report provides an extensive analysis of the current and emerging global lock washer market trends and dynamics in the global lock washer market. 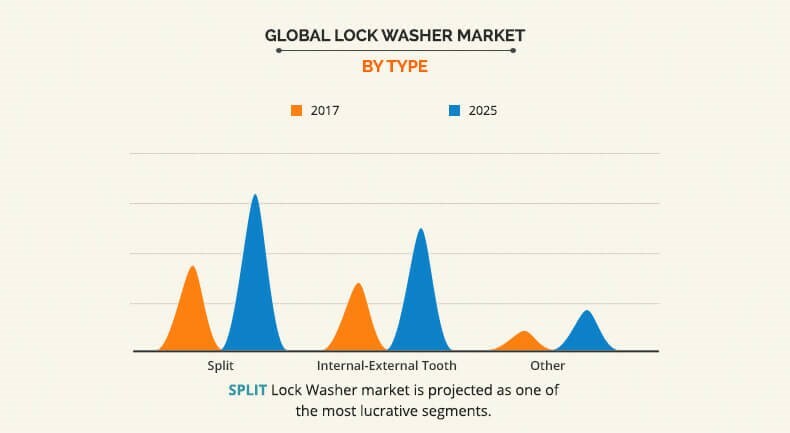 Extensive analysis of the global lock washer market is conducted by following key product positioning and monitoring of the top competitors within the market framework. Key market players within the lock washer market are profiled in this report and their strategies are analyzed thoroughly, which help understand the competitive outlook of the global lock washer market. 7.6. HANGZHOU SPRING WASHER CO LTD.
7.7. MIDWEST ACORN NUT CO. The global lock washer market is witnessing considerable growth in the emerging markets such as India, China, Latin America, and others. Furthermore, growth in the automotive, aerospace, machinery, and construction industries and demand for better quality lock washers are some of the major factors that drive the growth of the lock washer market during the forecast period. In addition, increase in industrialization and urbanization, particularly in the emerging markets, is further expected to fuel the market growth. However, increase in risk of corrosion, rise in prices of steel & iron, and fluctuating foreign exchange are anticipated to hinder the market growth. Asia-Pacific is witnessing the highest demand for lock washers, followed by North America, Europe, and LAMEA. The highest share of the Asia-Pacific market is attributable to an increase in demand for maintenance and repair activities, increased construction activities, and growth in automotive industry. In addition, various leading manufacturers such as Nord-Lock, Shakeproof, Disc-Lock Inc., Schnorr, Titan Fasteners, Hangzhou spring washer Co., Ltd., Midwest Acorn Nut Co., HEICO-LOCK (HWICO Group), Earnest Machine, and Wrought Washer Manufacturing, Inc. occupy a prominent revenue share in the lock washer market.